In April 2000, Texas Governor George W. Bush proclaimed a week of remembrance for the Holocaust. He said, « I urge Texans to never forget the inhumanity of those who perpetrated the Holocaust, and reflect upon our own humanity and our responsibility to respect all peoples. » Good advice. He should reflect upon his own family, if he is interested in reflecting on inhumanity. G. W.’s grandfather and great-grandfather, Prescott Bush and George Herbert Walker, were among the chief American fundraisers for Germany’s Nazi Party. Through industrialist Fritz Thyssen, the Bush-run Union Banking Company and W. A. Harriman & Company, the Bushes sold over $50 million in German bonds to American investors, starting in 1924. Thyssen in turn pumped money into the infant Nazi Party, which had proved its desire to rule and its willingness to use brute force in 1923’s Munich Beer Hall Putsch. George Walker, GW’s great-grandfather, also set up the takeover of the Hamburg-America Line, a cover for I.G. Farben’s Nazi espionage unit in the United States. In Germany, I. G. Farben was most famous for putting the gas in gas chambers; it was the producer of Zyklon B and other gasses used on victims of the Holocaust. The Bush family was not unaware of the nature of their investment partners. They hired Allen Dulles, the future head of the CIA, to hide the funds they were making from Nazi investments and the funds they were sending to Nazi Germany, rather than divest. It was only in 1942, when the government seized Union Banking Company assets under the Trading With The Enemy Act, that George Walker and Prescott Bush stopped pumping money into Hitler’s regime. George Bush, then an eighteen year-old man, held off entering Yale (a longtime Bush family destination, Prescott had graduated in 1917) to enter the military, perhaps to remove some of the tarnish from his family’s honor. 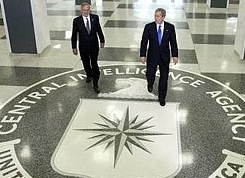 After the war, however, Bush joined the intelligence community and utilized his own connections to help fund drug runners from Laos to Panama. Most shocking was the so-called « cocaine coup » in Bolivia in June 1980, masterminded by fugitive Nazi Klaus Barbie, « The Butcher Of Lyons. » Bush, as director of the CIA, had funneled enormous amounts of cash to drug runners including Manuel Noriega and helped in the destabilization of Argentina. Barbie, who had been previously secreted in Latin America by the CIA, began working closely with the Argentines and used drug money to finance a neo-Nazi cabal, one that succeeded in overthrowing the government. The troops swept through the capital wearing Nazi armbands, according to former DEA agent Mike Levine. They may as well have been wearing armbands portraying syringes, dollar bills and « Bush For President » buttons. 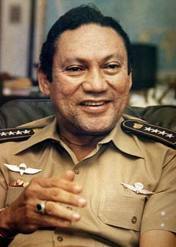 Manuel Noriega,the former « first of the classes » of the CIA will become a whipping boy. After the cocaine coup, the notorious Unification Church, the « Moonie » cult, began making inroads across Latin America. Among the first to arrive in La Paz after the Nazi/coke coup was Bo Hi Pak, Rev. 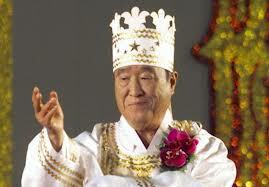 Sun Myung Moon’s right hand man. Moon had invested $4 million in the coup, it so turns out, and still had plenty of money left over to help finance George Bush’s campaign for president in 1988. Moonie lieutenant Thomas Ward also acted as the go-between between Barbie and his CIA payrollers. The Moonies were also large funders of the Contras and heavy investors in Latin America generally. Bush is still in Moon’s pocket: as recently as 1996, former President Bush flew to Argentina to appeal to Argentine president Carlos Menem to attend the gala celebration for Moon’s latest right-wing newspaper. Bush has made hundreds of thousands of dollars stumping for Moon groups since leaving the Oval Office, and has been working to make sure GW Bush gets his share of drug-tainted, Nazi managed cult money for the latest Presidential campaign. Sun Myung Moon, another criminal and slave mystical … closely associated with Bush. That is something we should all reflect on.